What will dealer websites look like in 10 years? When we were first challenged to speculate on car dealer websites a full decade from now, we didn’t know where to begin. We like to think our websites are already cutting edge and that means embracing future technology now. All we need to do to realise how much websites are going to change, is to look back 10 years. In 2005, the one billionth internet user had just gone online. It was a major milestone in the industry. We’d been producing websites for dealers for three years already, but it’s fair to say things were quite different back then! Twitter didn’t exist and Facebook was a tiny baby open only to university users. The web wasn’t really stylish yet, nor was it clever – it was text dominated and images were small. Functions were simple – look for a car, find an address, find a phone number, email an enquiry. The idea of going online on your mobile was revelatory – even mobile websites weren’t really a reality. In short, things have changed a lot and we are now entering a whole new level of internet usage. Lines are blurring between offline and online, technologies are blending together and internet access is getting more exciting, with the advent of wearables and ever-more-capable devices. So, what do we think you can expect to see on a dealer website in 10 years? Here are some of our favourite ideas – from the realistic, to the ridiculous and everything in-between! We already know that fewer and fewer visitors are walking into dealerships. They’ll often only pop in to test drive the car at the end of the research process. This could mean that, as interactions get even fewer, dealers reconnect with their customers and reinvigorate the sales process, by turning their website into an interactive digital version of their actual dealership. 360 tours with exciting interactive elements are already being implemented on dealer websites, but this could go much further. 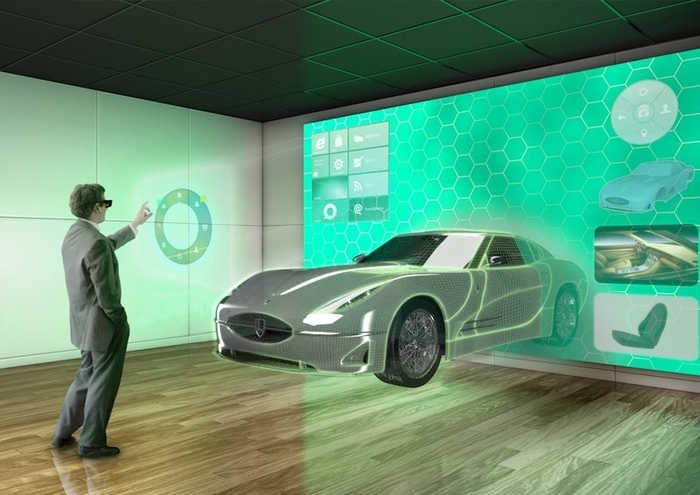 Customers could interact with web-cam connections to staff “in a dealership”, go on virtual test drives with ride along cameras and potentially find out everything they need about your business and your stock all without leaving the tour. Currently most websites have lots of pages. This comes from print, and we believe will become increasingly irrelevant. Instead, we can see websites moving more towards pageless websites designed to tell a story, look great and make it easy for customers to understand the business, whilst also finding the cars they want. Cutting edge websites are already moving in this direction, however it can be tough to know how to introduce retail elements like car stock – we reckon this will be ironed out and pageless design could be the trend of the future. Imagine – a website that changes to show you the content you most want or need. Sounds like magic, doesn’t it? However, we’re already working on functionality that can adapt what website content visitors are shown based on how they interact with the homepage, or where they come from. We can see this getting increasingly clever over 10 years. Not only will the website show more finance offers for finance visitors, for example, but it might even adapt to your previous visit behaviour or your social media profile. If you’ve tweeted a lot about performance cars the website might use this data to make the 0-60 or BHP figure more prominent. Maybe cars will have different photographs on different backgrounds to appeal to the fact that you’ve converted better previously on websites with a blue colour scheme rather than red. If you booked in for a service in May, the website may remember and push servicing information forward the following April. It will be about Big Brother treading the line between creepy and very, very useful. Cars are getting connected and it makes sense that down the line they’ll start plugging into your website. Especially since we’ll almost definitely see online payments for full, configured cars online! When someone buys a car, they’ll be added to the database. The car will then stay in touch. If they need a check-up or a service, the car will nudge the driver to get booking, or will consult their calendar and maybe even book it itself! Customers will have their own, highly personalised section of the website where they can view video messages, book required services and find out the latest news from the manufacturer. Bespoke tips will be generated based on their driving style to help them save money and every once in a while you’ll send them a new digital music download direct to their car, as a thank you for being a loyal customer. We already have responsive websites changing to fit the screen you are on. But what about if you access a website on your watch, then your tablet, and then your desktop at work? We predict that the future will find a way to track your activity across devices, meaning that rather than having to navigate back to the right page you simply open it and the page you were on is already there. It will know whether you’ve sent an enquiry and present test drive incentives or additional offers to sweeten the deal – regardless of where you last logged in. Bluesky Interactive are a cutting-edge dealer web design agency who are often first to the dealer marketplace with all sorts of new design trends and technology. Find out how they can future proof your dealer website by calling 0845 415 4853 today.